Experiment 626, better known as Stitch, is on the run...in vinyl form! 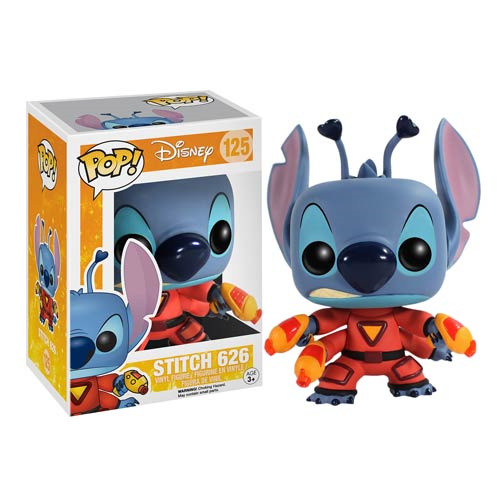 This 3 3/4-inch Disney Lilo & Stitch Experiment 626 Spacesuit Pop! Vinyl Figure presents one of the most beloved aliens in Disney''s rich pantheon, poised to add some pop culture to your house in a unique stylized form. The Stitch Spacesuit pop! shows the lovable scoundrel in his true form with 6 limbs, wielding laser guns and wearing his spacesuit. Bring him home today, or take him on a trip to Hawaii - he''ll be quite at home there! Ages 3 and up.